The sewer line is a vital part of the sewer system in a residential or commercial building, conveying all of the sewage waste and water to the central sewer. If the sewer line becomes damaged or dysfunctional, this can lead to health consequences and accidents that would be very expensive to fix. Sewer repair services are incredibly important as a result, and at Nu Flow Oklahoma, we strive to ensure that our methods are top-of-the-line and efficient. 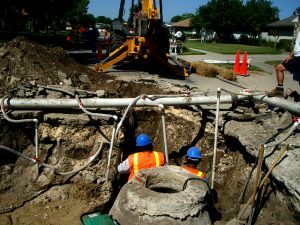 At Nu Flow Oklahoma, we take the guesswork out of sewer repair with our advanced sewer camera inspections. We take this time to record video of the sewer line and locate where the issue is. Once this is done, our experts provide pipe lining services that fully restore and repair your pipes, no digging required. These solutions can be completed in a single day, and whether we decide to fix your pipes with pipe bursting or pipe lining, we can ensure that the results will be worthwhile and affordable. Our trenchless pipe restoration methods are tested and trusted, guaranteed to satisfy our customers with excellent results. At Nu Flow of Oklahoma, we have years of experience and offer high-quality sewer repair solutions for residential and commercial buildings. Our employees are experienced professionals and provide excellent customer service, and we pride ourselves on offering trenchless repair solutions that don’t interfere with our customer’s daily routine. Our rates are competitive and ensure that the quality of work done is always priced fairly. If you are experiencing any complications with your sewer lines, give us a call at Nu Flow Oklahoma and we will be happy to work with you to provide the best, long-lasting solutions. Notice any problem with your sewer in Mustang, Oklahoma today? Give us a call at Nu Flow of Oklahoma and you would be glad you did.